The best customer service begins with the best possible preventative maintenance for the HVAC systems in your building, and that includes the data center, even if it isn’t a separate building. Keeping your computer networks safe during the depths of winter can be especially difficult during the cold. You need to make sure they don’t freeze, because any damages will make them inoperable, and your business could lose face with customers and clients. The best customer service begins with the best possible preventative maintenance for the HVAC systems in your building, and that includes the data center, even if it isn’t a separate building. When your employees are too cold, they won’t be productive. Similarly, if your server rooms are too warm, then the systems won’t work. During other times of the year, it’s important to keep your human assets comfortable. Even so, you can’t ignore the heating systems challenges you face when you try to keep your HVAC units operational – so what does this mean? The data needs to be cooled, but the rest of the building needs to be warm. Merely stopping the vents is not a good idea, because there needs to be a balance kept for the building to be comfortable for everyone in it. The heating system for the rest of the building clashes with the cooling infrastructure set aside for the server room, which can cause undue strain on the overall HVAC system and cause it to fail. Your company might not be able to withstand the downtime that results. Fortunately, there are numerous ways you can solve these dilemmas. To prevent future problems, you need to rely on your HVAC system’s preventative maintenance partner. Schedule an inspection and any necessary repairs that the inspection reveals to take place during the winter. This is doubly important if you neglected to have any repairs completed during the fall, as you will definitely want to be sure everything is in fine working order when spring and summer return and new challenges arise. Next, comply with the latest standards suggested by the American Society of Heating Refrigerating and Air-Conditioning Engineers, or ASHRAE. When you do, you’ll find that your HVAC system is much more efficient and encounters fewer problems. 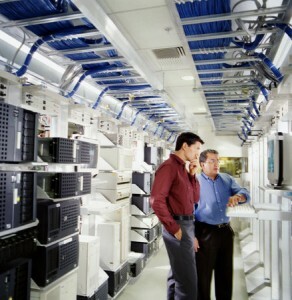 One last suggestion is to speak to your commercial HVAC system partner about the possibility of installing a computer room air conditioner, or CRAC system. The CRAC system is much more useful for larger data centers, but that doesn’t mean your smaller data center can’t benefit from it. This entry was posted on Friday, February 1st, 2019	at 1:14 pm	and is filed under Data Center Commercial HVAC . You can follow any responses to this entry through the RSS 2.0 feed. Both comments and pings are currently closed.